Balbo was a Fascist. He was instrumental in bringing Benito Mussolini to power in Italy, and later was expected to succeed him. In 1926 he was appointed Minister of Air by Mussolini. In 1933 he built 25 Svoia-Marchetti SM.55X flying boats and flew them in formation across Europe to the United States, to the Chicago World’s Fair. In response he was invited to lunch by President Roosevelt, and Chicago renamed 7th street Balbo in his honor. The stamp, issued by Paraguay to honor Italian contributions to flight, shows a map of the countries bordering the Atlantic Ocean with the routes of many of his Formation Flights. The stamp also commemorates “La Epopeva National de 1864-1870.” The War of the Triple Alliance, Brazil, Argentina and Uruguay against Paraguay, was fought during those years. At the end only 28.000 male Paraguayans were still alive, and Argentina and Brazil took 55,000 square miles of Paraguay. After 1900 there was a surge of immigration from Europe, including Italy. In 1933 the Italian Flying Armada visited Iceland enroute from Rome to Chicago. The three stamps on the sheet picture Christian X of Denmark, who governed Iceland until 1944. 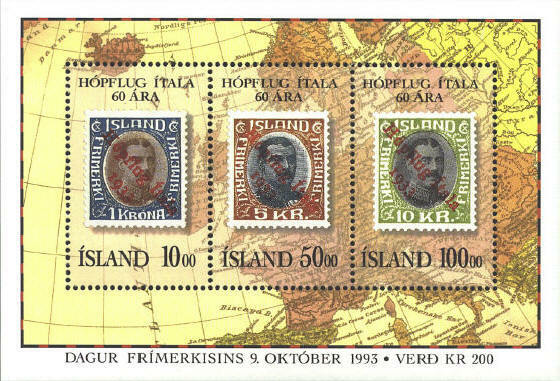 The stamps are surcharged for the postage on items mailed from Iceland to the United States via the Italian seaplanes. The sheet commemorates the 60th anniversary of the visit. The map of Europe in the background of the souvenir sheet is presented on a mercator projection. There is no indication of the year of publication of the map, or of anything significant about it, other than that it shows both Iceland and Italy.